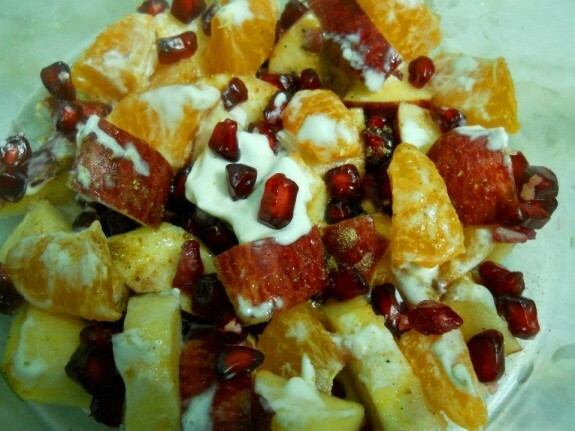 Discover this delicious and easy to prepare this fruits salad without any gas oven. Tossing chopped fruits in a bowl with fresh cream give you a refreshing day. It is one of the great additions to your meal. 1. Cut all the fruits into cubes. 2. Take a bowl and add all the fruits. Add fresh cream and chaat masala powder and mix well. 3. Your fruit salad it ready to serve. You can keep it for 1 hour in refrigerator to make it yummier. Note: Yogurt or Curd can also be used instead of Fresh cream. In that case, you need little salt and sugar to mix on the yogurt.